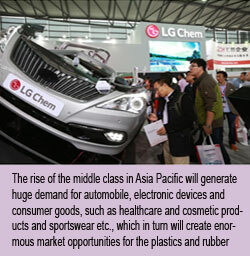 China remains at the epicenter of the global plastics industry. 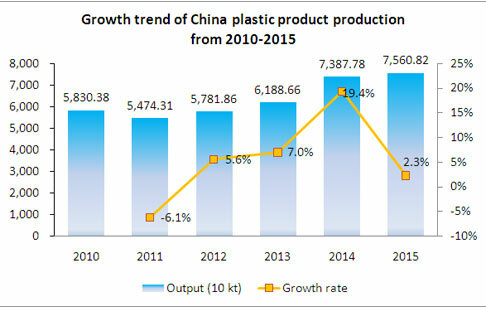 Its domestic plastics and rubber sectors continue to experience stable growth, while benefiting from government support and from its location in the heart of Asia. Across the region, which already represents a significant percentage of the world’s GDP, a strong middle class is emerging, along with a huge appetite for consumer goods, vehicles, housing and the like. This positions the annual Chinaplas trade fair as the perfect platform for showcasing all that the polymer industries have to offer. China's plastics industry has expanded tremendously in the past three decades. It even experienced steady growth during the past five years, while China's annual economic growth rate slowed to a 25-year low of 6.9% in 2015. In this “new normal”, China’s economy is projected to grow at an even slower rate in the coming years. But the country’s economy remains massive, and some enterprises now see this as the right time for them to focus on enhancing productivity, efficiency and competitive advantages. Chinaplas 2017, to be held next May in Guangzhou, in southern China, is expected to set a record in terms of its scale, reaching 250,000sqm of exhibition area. While expanding its size, the organizer also is dedicated to developing Chinaplas as a technology-oriented show with a focus on key topics of “Intelligent Manufacturing”, “High-tech Materials” and “Green Solutions”. This matches up well with the key development directions of the plastics processing industry set under the China’s 13th Five-Year Plan, including developing multi-functional, high-tech materials and additives, accelerating the market share of high-end products, speed up research and development of plastics equipment as well as green, energy saving and high efficiency new processing technologies. As for plastics machines, Chu pointed out that while China has imported a lot of advanced technology from Europe, many major European plastics machinery suppliers have set up their production facilities in China either through wholly owned subsidiaries or through joint-venture companies. Such strategic investments underscore the increasing importance of the China market on the global stage. Moreover, with years of development, China's plastics machinery suppliers have also geared up. In terms of volume, China has been the largest plastics machinery manufacturing country in the world for more than 10 consecutive years. Some of the country’s top brands are now actively building up their overseas plants and networks to support aggressive export drives. Chinese-made machines are very popular throughout Asia. In 2015, Vietnam, Thailand, Indonesia, India, South Korea and Malaysia were among the top 10 export markets for China’s plastics machines. Chinaplas 2017 will take place from 16-19 May 2017 at the China Import & Export Fair Complex, Pazhou, Guangzhou, PR China. As Asia’s No.1 plastics and rubber trade fair, the show will bring together the most ground-breaking plastics and rubber technologies, a wide array of raw materials, and extremely cost-effective processing and management solutions from 3,300 Chinese and overseas exhibitors. This will include 12pavilions, including large groups from Germany, Austria, Italy, Switzerland, Taiwan, Japan, South Korea and the US. Buyers from companies of all sizes will discover advanced solutions to cope with their challenges, ranging from operation optimization and cost savings to sustainability and new-product development. For more information about Chinaplas 2017, please visit the official show website at www.ChinaplasOnline.com.